Locherber Home and Spa - Vivasan Webshop English - World wide delivery Vivasan Official Webshop® is specialized in shipments to the UK, Ireland and Scandinavian countries. Best prices! Locherber Home and Spa surprises with a line of selected essences and fragrances such as linen buds, rice germs, fig and rose, Baltic amber, green tea, tangerine and cinnamon. 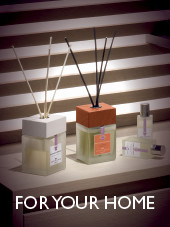 Decorate your home with Essence Diffusers. Relax with Spray Diffusers and scented marble stones. Go out and experience life with great eau de parfums top fragances.